Lizzy and Reid met at a wedding, where Reid’s brother married her best friend. After that meeting they were inseparable. When Reid asked Lizzy to move to Wisconsin with him she had her reservations. She jokingly agreed only if they could take a warm vacation every winter. One February, after 3 years together, he proposed to her at sunset on her 30th birthday vacation to Cabo. They decided on a destination wedding through a few key factors; Lizzy is an event planner and knew she didn’t want her wedding to feel like work, she also knew she had to get married on the beach since she’s a total beach lover. They looked into Florida and South Carolina and after more research, they agreed on a wedding abroad as you get so much more bang for your buck. Sandos’ wedding department made everything easy. The resort worked with them on every detail, even allowing them to switch out a solo violinist for a live Mariachi band, included with their package. They always knew what was happening, be it budget or decor, nothing was hidden during the process. They had a sunset beach ceremony with 85 guests. Afterward, they hosted a cocktail hour at Bar Finisterra’s rooftop terrace overlooking the marina and featuring a buffet dinner reception. Lizzy said, “I knew I wanted to dance underneath the stars.” Guests stayed anywhere from 3 to 5 nights on average. 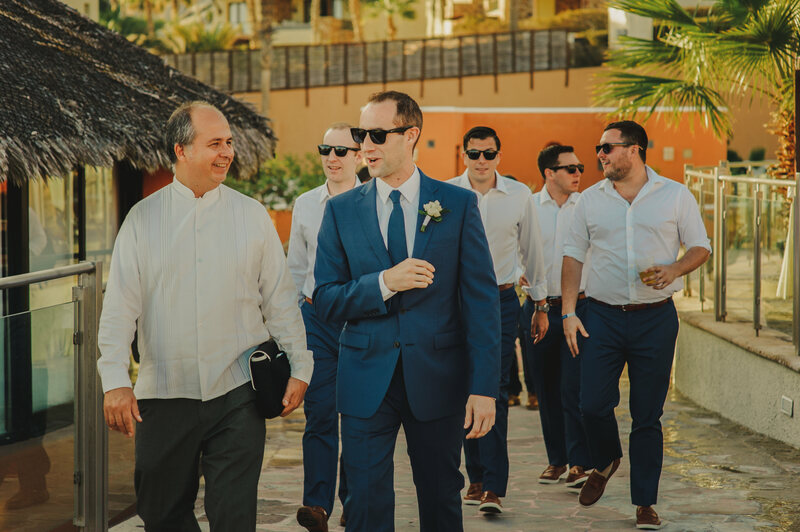 Beyond the wedding ceremony and reception, the couple also held a spontaneous welcome party at the lobby bar, and they hosted a whale watching boat ride that everyone took together. In the couples’ case, more people came then they ever expected. They originally guessed 35 guests would attend. They recommend watching your package’s capacity in accordance with your personal guest list. Every guest was accommodated easily, but cost extra beyond the package’s initial capacity. The couple let their guests know their plans for a destination wedding immediately, even before save-the-dates were sent, which allowed for their guests to save, budget, and attend the special trip. On the night of the wedding, we weren’t bouncing around saying ‘Hi’ and making small talk with everyone because at that point we had already seen everyone.